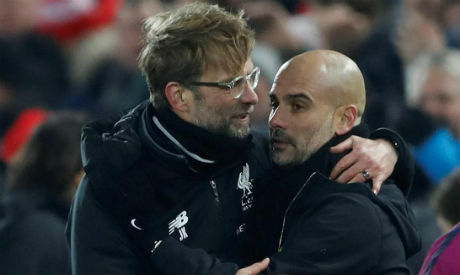 Manchester City manager Pep Guardiola has hailed Premier League leaders Liverpool as the best team in Europe, but said his side could take inspiration from last season's 5-0 win at the Etihad Stadium ahead of Thursday's showdown between the two. City's thumping of the Merseysiders last season was one of the highlights of their title success but Guardiola's side have run into trouble this season, losing three of their last five league games to sit third with 47 points. Unbeaten Liverpool have taken full advantage of City's dip in form to open up a seven point lead above them and raise fans' hopes of a first league title since 1990, but Guardiola reminded his gifted team of their potential to close the gap. "Last year we beat them 5-0 here. It's Liverpool, the best team in England's history. We can beat them. I know today nobody trusts us but it is what it is," Spaniard Guardiola told a news conference on Wednesday. "They are in the moment the best team in Europe, in the consistency, the way they control the details in their game. We are going to focus on what we have to do to win the game. Everyone is talking if we lose, but we can win," he said. The teams' latest meeting ended goalless earlier this season and Guardiola likened Thursday's game to the second leg of a knockout clash. "The reality is clear. We're seven points down. This will be the second game of the second leg so there are a lot of points to play for," Guardiola added. "He trained today but tomorrow we need another check in the morning. He's much better," Guardiola said.